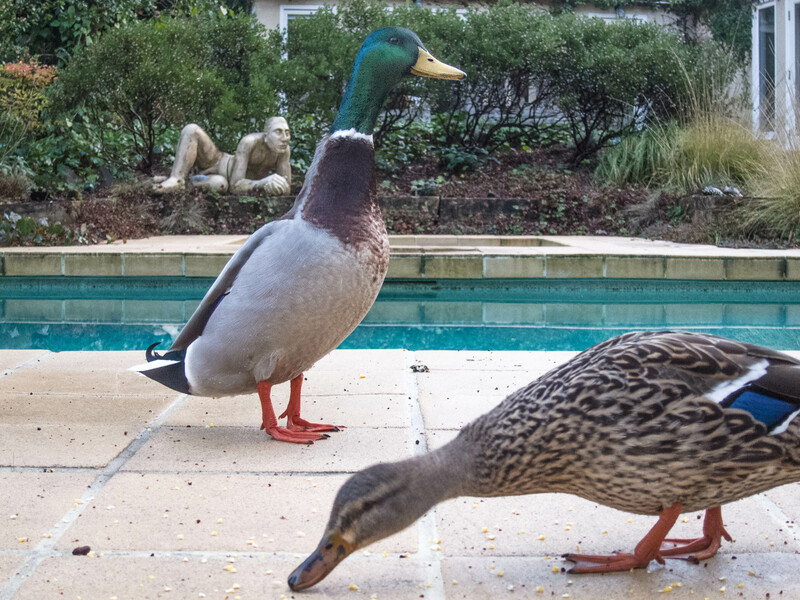 My favorite migrating ducks, Sir Francis Drake and Queen Elizabeth I, are stopping at our house and pool for the fourth time, arriving today for their annual visit. I think the point of their stop is to lay some eggs and make a few ducklings, but I’ve never actually seen a baby bird. Either they’re not very good at it or the hawks and raccoons are too fast for them. We feed the chickens cracked corn, and the ducks like it just as well. They already come when I go out to feed them, maybe this year I’ll get Elizabeth to eat out of my hand like the chickens do. I don’t know how long they will be here, or if they will be back next year, or why they chose our house. I just like them, and plan to enjoy them while I can. I assume you haven’t mentioned to them about their Cambodian cousins. I doubt if Frank and Elizabeth are anywhere near as tasty as the ones we had in Siem Reap.